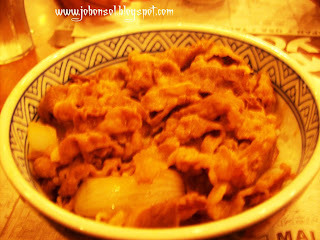 Being a foodie, I was invited to the Yoshinoya Beef Gyudon Eating Contest yesterday at Megamall. 15 bloggers were selected to participate and I tried my shot at eating more than a bowl but since my stomach was used to not eating dinner (following an after 6pm diet) it was difficult to finish even a single bowl. Beef Gyudon was strips of beef on top of rice cooked in a wonderful tasty sauce. It was delightful to try it and I will definitely recommend it to all the foodie public school teachers who always hunt for restaurants to eat. Many of you do not know most who frequent restaurants are teachers like me and I am so happy to share the gift certificates to all my colleagues. 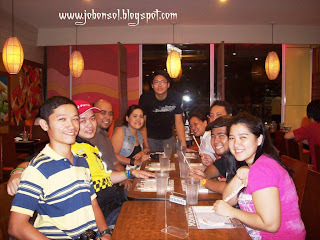 Thanks to all the bloggers who I've met at the event, Dante Ward, Jonel Uy, Brian Ong, FPJ and the others I forgot to ask names. Congratulations to Jayson Biadog for winning. My deepest gratitude again to Mrs. Lala Habana, Operations Manager of Yoshinoya Philippines and to Elma..Hope to see you guys again..